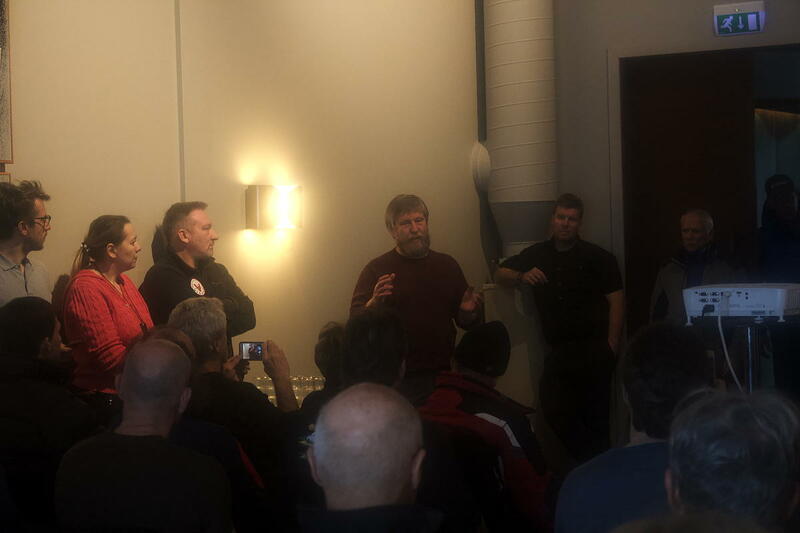 Victor Boyarsky, manager of expeditions for the Barneo ice camp, explains why this year’s North Pole season is being cancelled during a meeting Friday at the Radisson Blu Polar Hotel. Photo by Mark Sabbatini / Icepeople. Barneo officials and a pilot from Canada brought in on short notice for flights to the base told a few dozen expedition leaders and customers in a meeting Friday afternoon at the Radisson Blu Polar Hotel that plans announced during the morning about departing flights beginning that evening were quickly dashed because the short- and long-term weather forecasts were no longer favorable. For Aparna Kumar, 44, an Indian border and police officer who has scaled the highest mountain peaks on six continents and in January reached the South Pole, said she was rushing to prepare for a flight this evening when she heard at about 1:45 p.m. the season was cancelled. The cancellation means an end to Kumar’s hopes of achieving an explorer’s “Grand Slam” this year by reaching the North Pole before a planned summit attempt on Denali in June for her seventh continental peak. She said she spent about 39,000 Euro for the North Pole expedition and at this point is hoping Barneo will allow her to use those same funds to return in 2021. But while plenty of grievances were voiced about the overall situation, little of it aimed personally at Boyarsky and other camp officials at the meeting, especially by expedition guides who have worked with some camp staff members for many years despite some notorious management changes. 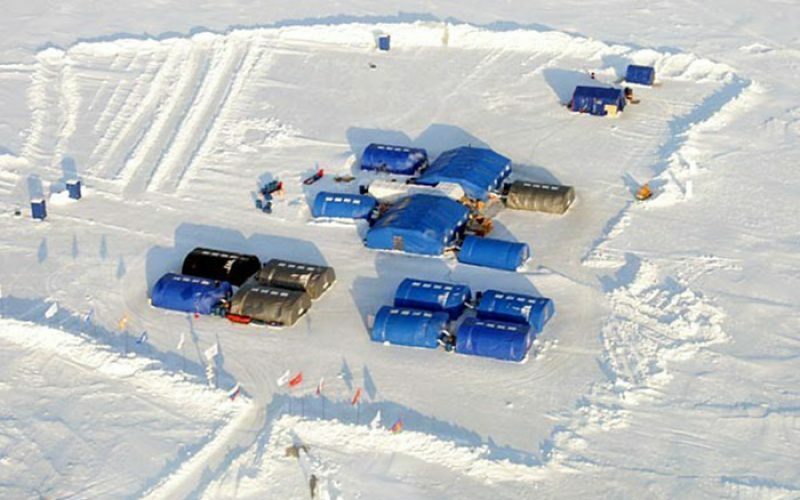 The Russian-operated ice camp, established annually on an ice floe somewhere north of 89 degrees latitude north since 2002, typically opens at the beginning of April for a season that lasts three to four weeks. Near the end of the month the sea ice cover is usually no longer stable enough to support the camp or people making the popular 111-kilometer “last degree” ski trip to the North Pole that takes seven to ten days. Expedition hopefuls at the meeting voiced a range of anger and concerns about “this fiasco,” including updates during the delays that proved unreliable, compensation for those cancelling expeditions, and a reluctance to let a company that last year purchased ownership of Barneo to carry over funds already paid until next year on the assumption the camp will be operating then. For instance, one leader questioned why they were told Friday morning the season would finally be going ahead even though it was seemingly obvious some officials had different information. Boyarsky and other camp officials said the morning meeting was based on information they had at about midnight when they were preparing for the briefing and they weren’t aware of the updated forecasts until afterward. The season cancellation announcement came shortly after the North Pole Marathon announced at about noon the cancellation of its race, depriving Barneo of its largest group as the roughly 50 participants represented about one-fifth of the camp’s typical total visitors. Unlike many participating in “last degree” ski expeditions of a week or more who budget considerable financial and scheduling flexibility into their plans – especially due to major operational disruptions at Barneo in recent years – marathon participants typically spend a total of two days at the ice camp for the race and flight for a short visit to the North Pole. Marathoners pay roughly 15,000 Euro to participate (not including travel costs to and from Svalbard), while those on longer expeditions pay 20,000 and sometimes much more. In addition to those immense costs and frustrations at seeing their dreams thwarted, waiting out long delays in Longyearbyen means a daily struggle to find lodging due peak spring tourism season when rooms are typically full (leaving some to sleep on floors and boats this year), as well as other logistical headaches. Barneo has experienced increasingly chaotic seasons in recent years due to climate and political problems. This year’s “official” opening of April 1 proved a farce as a few days of delays due to problems completing the ice runway collapsed into political turmoil due to Russian officials banning Ukrainian pilots and crew from flying expedition participants to the camp, apparently stemming from the hostilities related to Russia’s annexation of Crimea in 2013. While a replacement plane from Canada was in Longyearbyen on Friday, its pilot told those at the meeting that favorable weather during the past week has now given way to poor and unpredictable conditions with no assurance flights will be able to reach Barneo to bring expeditions back to Svalbard when trips are complete. Camp officials said they are still planning operations next year with plans to give priority to those who booked this year. But many guides and participants at the meeting were not reassured. Boyarsky said his company has 25 years of experience, is financially stable, will provide full refunds to those who cancel, and will cover travel costs getting to and from Svalbard for those wanting to participate in expeditions next year. “For those of you who decide to postpone and come back, we will pay all tickets for next year,” he said. But amidst all the hostility, one woman at the meeting thanked the Russian officials for the extensive logistics and hosting work they do each year and said she isn’t abandoning her hopes of reaching the top of world with their assistance. Several attendees exchanged hugs with Boyarsky after the meeting. “You did the best you could,” one guide told him.